We recently showcased an interior glass door in the home of Mike & Connie Roseland. The oversized, custom door provides an unobstructed view throughout the home. Upon completion of the interior door, we began designing an updated front door for Roseland home. 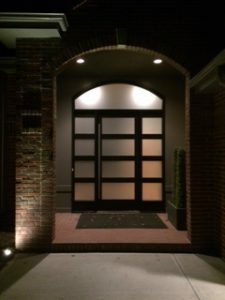 In addition to functional, the Roselands wanted a unique door that would provide a stunning entrance and enhance the beauty of their brick home. The result is a large, custom door made with 4 large rectangular pieces of satin etched tempered over clear tempered insulated glass unit. Side lites and an arch top transom extend surround the door. Natural light floods the home, yet the frosted look of the glass ensures privacy at the front of the home. The custom door sits back several feet from a brick archway on the front of the home, mimicking the shape and creating a beautiful entry to the home. At night, the glass is illuminated by interior lights, creating an eye-catching focal point. Stop by our office and visit with one of our experienced designers about how we can create a beautiful custom glass feature for your home. Quality Glass & Mirror is Hiring!